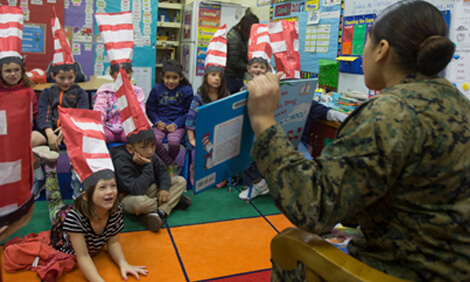 A U.S. Marine read a Dr. Seuss book to students at an elementary school on a U.S. military base in Okinawa, Japan, on Dr. Seuss Day. Each year on March 2, students in the United States celebrate the birthday of Dr. Seuss. He was a famous children’s book writer. Dr. Seuss Day is also known as Read Across America Day. This year, it will take place on March 1, so it can be celebrated on a school day. Dr. Seuss is the name Theodor Seuss Geisel used to write many well-known children’s books. Some of his best-known books are Horton Hears a Who!, Green Eggs and Ham, and Oh, the Places You’ll Go. Dr. Seuss was born in 1904 in Springfield, Massachusetts. He grew up not far from the street that became the subject of his first children’s book, And to Think That I Saw It on Mulberry Street. He read a lot as a kid. He loved books that were funny and used language in unusual ways. He also liked to draw. In high school, he drew cartoons for the school newspaper. When he first started college, Dr. Seuss wanted to be a teacher. He soon found out he rather write and draw instead. He became a writer and published more than 60 books in his lifetime. One of his most popular books, The Cat in the Hat, was written in response to a challenge. Two book publishers asked him to write a book using more than 200 vocabulary words. Read Across America Day was started in 1998 by the National Education Association (NEA). The group decided it should be held on the same day as Dr. Seuss’s birthday. The day reminds students how important reading is. Reading a lot helps many students do better in school. On Dr. Seuss Day, people host events at schools, libraries, children’s museums, community centers, and bookstores. At local libraries, kids can listen to storytellers read favorite Dr. Seuss books. At some schools, kids celebrate by eating green eggs and ham. Some students bring their favorite books to school and share them with their classmates. This year, a school in California wants to break the world record for the “Most People Wearing a Dr. Seuss Costume” in honor of Dr. Seuss Day. What is one way you can celebrate Dr. Seuss Day? Find out if your school or local library is hosting an event. Check out the activities and printables that help celebrate Dr. Seuss Day. Learn more about Dr. Seuss from the museum in Springfield, Massachusetts, dedicated to him. Visit to do activities with the Cat in the Hat. When is Dr. Seuss's birthday? How many books did Dr. Seuss publish in his lifetime?